If you are one of those who want to have some daring, bold and audacious experience in their lives then Skydiving at Dubai Marina is an ideal destination for you. It is the only centre in the Middle East which offers professional staff, superb facilities, and of course state-of-the art equipment. At this centre, you will surely have an extraordinary Skydive over one of the most awe-inspiring views in the world. There is a short training course designed for the visitors in order to get familiar about this thrilling adventure. For further details about Skydive Dubai take a look at this step by step guide for your convenience. For those who have never experienced this breathtaking adventure before, there is a tandem jump method for them in which they will be guided under the close supervision of an expert USPA rated (United States Parachute Association) Instructor. The great thing about tandem jump is that you will be accompanied by your instructor throughout the whole adventure. After completing necessary paperwork, you will be given short briefing regarding equipment, canopy, exit, body position and landing techniques. You will be above 13,000 feet with your instructor before diving. 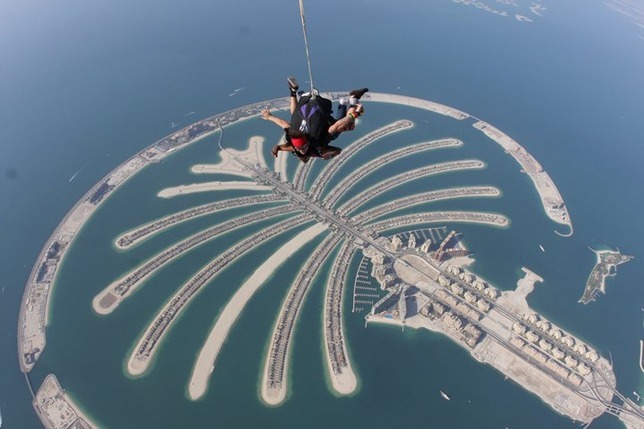 During the freefall you will have a memorable experience, and when you will be at about 6,000 feet, you will be advised by your instructor to open your parachute over the stunning Dubai coastline. - You have to present your valid ID to prove that you are 18 years old or above. - Your weight should not exceed 110 kilograms (about 245 pounds). - Make sure to reach at Skydive centre 15 to 30 minutes prior to your scheduled reservation time. - In order to make your reservation in advance, you have to deposit 750 aed. (Payment can be made online by Credit Card). -You are not allowed to drink alcohol or take any drug before making a tandem skydive. -Make sure to wear comfortable and athletic clothes. Bring sneakers or sport shoes as you are not allowed to wear sandals, boots or shoes with heal. If you any queries in your mind, you can contact on the given phone number and email address. 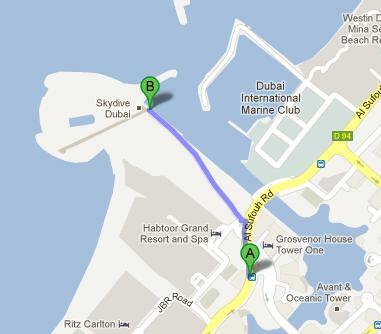 Skydive Dubai is located near to the Habtoor Grand hotel, just between Dubai Marina and Jumeirah Beach Residence. By bus: Jumeira, Royal Meridian 2 is the nearest bus station to Skydive Dubai, and buses number 8 and F37 serve this station. It is 900m away from the centre and by walk you can cover this distance in 11 minutes. Head north on Jumeirah Beach Rd and continue onto Al Sufouh Rd/D94. Then take left and then turn right and you will see your destination. For a detail view of the pedestrian route, follow the link.